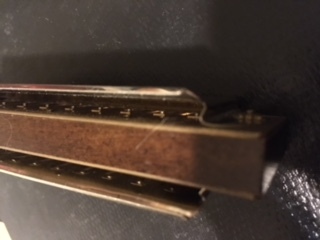 Old Harp in G what is this one? 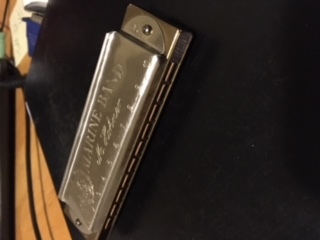 I was given this harp by a fellow who purchases things for sale at his antique mall booth. It is in great shape but needs cleaning before playing. I have no idea what I have though. Seems so odd. I can play each row individually, bending as well. When hole one is played wiith both top and bottom an octave is heard, but now bending is not available. I better clean it though as its pretty dusty and ichy before attemting anything else. So what is it called? any idea on vintage? Any advice on playing this instrument? It has been difficult to find a picture or write up on this one. The pics didn't show up, but I know the one you're talking about. It's the Marine Band Concert, an octave harp in Knittliger construction. The Hohner Auto valve was built the same way but with valves. Production of the Auto Valve ended aobu 2013. 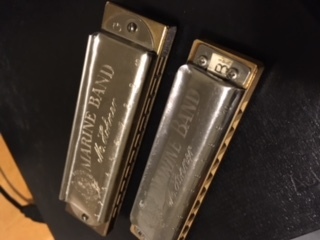 Harps built this way were available from about the beginning of the 20th century until recenty. If yours has the star on the bottom cover, it's pre-war. Otherwise its post war. Little Walter used one on Muddy Waters' record of Crawlin Kingsnake.